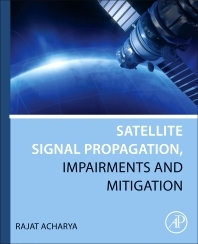 Satellite Signal Propagation, Impairments and Mitigation covers issues related to satellite link design. The book develops every concept from elementary physics, covering the basics of signal propagation from Maxwell’s equations and then gradually developing the physical reasons for impairments. It emphasizes the unique concepts for each involved process, based on their physics, and explains how they form the determining factors for the related suitable engineering technique for mitigation. Every basic principle is followed by mathematical substantiation with an explanation of the physics behind the equations. 1.5 How to best utilize the book? Dr. Rajat Acharya works as a Scientist at the Space Applications Centre, a unit of the Indian Space Research Organisation (ISRO). He is involved with the Indian Satellite Navigation program of GAGAN and IRNSS for more than a decade with pertinent contributions in ionospheric modelling. He is also a Faculty member at the Centre for Space Science and Technology Education – Asia Pacific, where he teaches on the M.Tech course on Satellite Communications and Satellite Navigation. He serves as a visiting Professor at Gujurat University, teaching on the PG Diploma course on Geo-informatics and Satellite Communications. He was also a member of the working group on models and algorithms from ISRO in the second meeting of the International Committee on Global Navigation Satellite System (ICG).